Today we are discussing how runners can choose the right running surface to run longer, recover faster and heal running injuries. If I were to ask you to make a list of all the tools you have that help you run, what would you come up with? Think for second about the tools that you have at your disposal when you are training for a race. There are really only a few. The first thing that you probably thought about was your running shoes. You may have even thought about your GPS watch and heart rate monitor as training tools. Maybe you even thought of your training plan, your gym, or the advice of your coach as a tools that you use to maximize your fitness. You might have even thought about your nutrition plan or even your blender. But really, in the simplest sense, the most important tools affect your biomechanics and the way to your body hits the ground. For most people that means running shoes. But the running shoes are really just a buffer between you and the ground. See you have to think about the ground moving underneath you as you run. So although most runners don’t think about the ground, or the specific running surface, it can actually be a tool that you can deliberately choose to increase or decrease stress if you want to run longer or heal faster. Whether you realize it or not you already use specific running surfaces to alter the amount of stress when you run. Think about hill repeats. With hill repeats you find a steep surface any run up and down the hill. Running uphill he hill dramatically increases the amount of stress and strain on your muscles. This of course causes tissue damage. Then when you rest and heal that tissue damage, you get stronger. I don’t really think there is anything more effective than hill repeats to dramatically increase running specific strength. The point is to help you understand the simplest example of how the running surface can affect you. Of course, most runners want to get stronger. But no runner wants to get injured. Yet it does happen. Overtraining injuries are a fact of life for runners who train hard. So you have to understand the running surfaces variables that you can identify and then use to your advantage when you’re trying to decrease the amount of stress and strain to an injured structure. This could be a metatarsal stress fracture or plantar fasciitis or an Achilles tendon injury. But to simplify things in this discussion we’re going to talk about a specific injury to help you understand how modifying or altering the running surface can decrease the stress on that particular structure, for that particular injury. Once you understand all this of course you can just extrapolate it to your particular foot and area of concern. The plantar fascia is the largest ligament in your foot and it is the most common cause of foot pain. And because the plantar fascia starts to hurt on one specific side of the foot it’s a great example to use when discussing running surface selection to decrease stress to a specific structure. To get started we are going to define some medical terms. So prepare yourself for about 20 seconds of boring terminology. Look at your right foot, the inside of your foot toward the arch is what doctors refer to as the medial side of the foot. The outside of your foot where your little toe is what doctors refer to as the lateral side of your foot. The anatomic sections the plantar fascia is named according to these terms. There is a medial band, a central band and a lateral band of the plantar fascia. The inside of the foot near the arch (or the left side of your right foot) is the medial band. And it’s the medial band that always gets strained with plantar fasciitis. So when you get plantar fasciitis and you’re trying to heal, or if you have had plantar fasciitis and you want to get back to running without straining the plantar fascia you need to decrease the stress and strain to the medial aspect of that foot. One of the most common recommendations doctors seem to make to patients who get plantar fasciitis is to decrease activity. And of course for a runner that means stop running. But by definition a runner wants to run. So I understand when runners get frustrated because some doctor told them they have to stop running to heal their plantar fascia. In many cases of plantar fasciitis, it is possible to run and still heal. The plantar fascia ligament is irritated, inflamed and perhaps even has some micro-tears in it, but it can still heal if you take some simple actions and precautions. We know the average person (non-runner) with plantar fasciitis, should get better with the proper treatment. Part of the treatment focuses on decreasing stress and strain to the plantar fascia. But we doctors don’t expect the person to stop walking. Running certainly causes more stress than walking, but there is a range of force. Just like running is more straining than walking. Running hills is more stressful than running on flat ground. Running fast and landing as a heel striker is more stressful to the plantar fascia than running at a moderate pace and landing as a mid-foot striker. 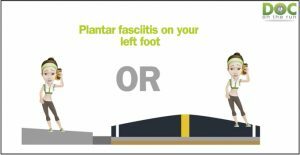 The first step in figuring out how to run with plantar fasciitis is realizing that you have several variables that can either increase or decrease the amount of stress and strain on the plantar fascia. Once you have identified the variables that stress the plantar fascia, you can manage the forces applied to the plantar fascia. If you decrease the strain below the threshold at which healing can still take place, then you should be able to run even while you are treating plantar fasciitis. Okay so now we’re going to spend another couple of minutes on boring medical terms. But stick with me, it will help if you understand these. Pronation is the motion that irritates the injured plantar fascia. Pronation is your body’s way of adapting to uneven surfaces and absorbing the jarring force of gravity when you walk and run. As you pronate, the foot moves in three directions: dorsiflexion, eversion and abduction. Every one of these three directions of movement stretch the plantar fascia. It may help to understand each one individually. Dorsiflexion is the motion of the foot moving up away from the ground and toward the front of the shin. Dorsiflexion happens when you sit in a chair, keep your heel on the ground and pull your foot and toes up off the ground. Dorsiflexion also happens when your pull your toes and foot upward to avoid tripping over your toes as your unweighted leg swings forward over the ground at mid-stride. 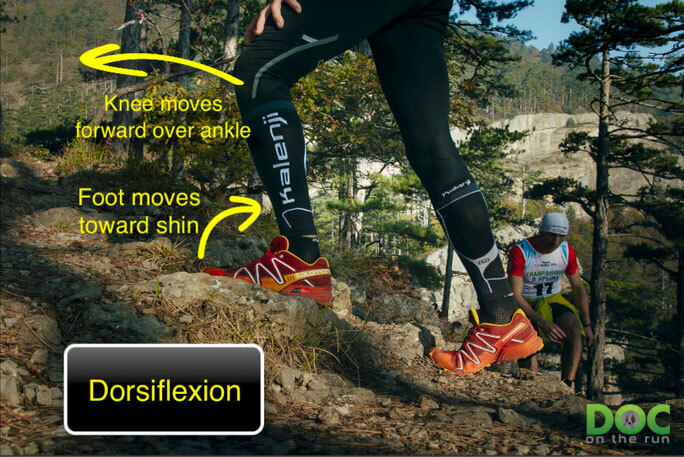 Technically, dorsiflexion also happens when you stand with your foot flat on the ground and move your knee forward; your foot is moving closer to the front of the leg. The steeper the slope, the more you must dorsiflex your foot. The most stress on the plantar fascia happens at the moment when you are running up a steep hill, your knee moves forward over your foot, your heel comes up off the ground and the big toe is forcibly flexed. This motions tightens the fascia to its maximum tension. When this extraordinary tension on the plantar fascia is coupled with the force of propelling your entire body weight up the slope, the strain can stretch the plantar fascia to the point of tearing. Running on hills is the first thing you should eliminate when trying to run with plantar fasciitis. Stick with flat ground if you want to mitigate the dorsiflexion component of pronation. Calcaneal: adjective; pertaining to the heel bone. Inversion: titling with the base of the heel toward the midline of the body. Eversion: tilting with the base of the bone away from the midline of the body. So standing facing across the slope, the downhill foot is inverted. The ankle is rolling outward, heel bone is titling inward with the base of the heel bone toward the midline. The downhill foot is supinated which is decreasing the tension on the plantar fascia. The uphill foot is everted. The ankle is tilting inward, the heel bone is titling outward with the base of the heel bone away from the midline. The uphill foot is pronated which is increasing the tension on the plantar fascia. The point of all of this is not to bore you with jargon. The point is to make it clear that one slope makes plantar fasciitis worse, but one slope can actually put the foot in a position that decreases stress on the plantar fascia and can help it heal. You probably already know that most road surfaces slope. The slope of the road is designed to allow rain water to run off the driving surface and drain through the gutter. The center line is painted at the peak or “crown” of the road. In the very middle of the road, the surface is flat. This is why many marathon training manuals recommend running in the middle of the road during a marathon. Running on one side or the other of the road puts an extra strain on the structures of the foot and ankle. Running at the far right of the road (with your back to traffic) has you running along a slight slope. The right foot is supinated, the heel bone is inverted and the stress on the right plantar fascia is decreased. The left foot is pronated, the heel bone is everted and the stress on the left plantar fascia is increased. You probably also have realized that sidewalks are also titled toward the road to allow rain water to run off to the gutter. If instead of running on the road you run on a sidewalk at the right side of the road (with your back to traffic) you are running along a slight slope. The slope on the sidewalk is the opposite of that on the street. The left foot is supinated, the heel bone is inverted and the stress on the left plantar fascia is decreased. The right foot is pronated, the heel bone is everted and the stress on the right plantar fascia is increased. Most runners are creatures of habit. We run the same routes, on the same sides of the road, in the same direction day after day, for whichever distance fits our training schedule. Knowing what helps or hurts the plantar fascia in your routine can be the difference between running and limping. Many runners have a rule of “always facing traffic” when they run in the road. The main reason for this is to avoid getting hit by a car. Running at the edge of the roadway facing traffic can place an excess strain on the right plantar fascia. But at the same time it decreases stress on the left plantar fascia. So if your left plantar fascia happens to be the one that is aching, you should run at the edge of the road, facing traffic. If you instead have plantar fasciitis on the right, you should not run in the road facing traffic. But you could keep facing traffic, simply hop on the sidewalk, reverse the slope, invert the right the right heel, supinate the right foot and help the plantar fascia to heal. To decrease stress on the right plantar fascia, run on the right side of the road with your back to traffic or on the left sidewalk facing traffic. In cases of plantar fasciitis on the left foot, run on the left side of the road facing traffic or on the right sidewalk with your back to traffic. One special hazard to keep in mind when running on the sidewalk are the driveway cut outs. The sharp slope as a driveway is cut through the sidewalk can be as much as 30 degrees. 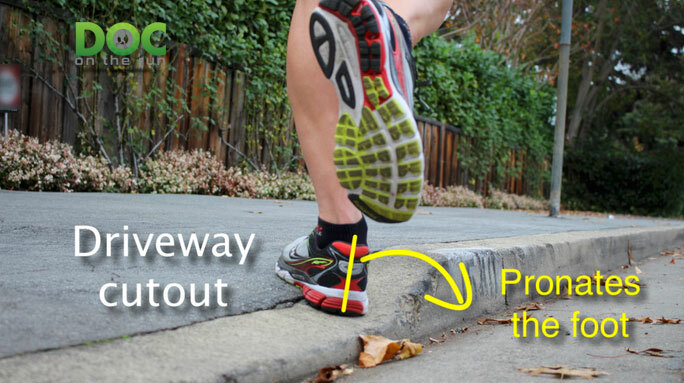 Make sure you avoid the abrupt drop-off and jarring pronation of landing on the driveway cutouts. 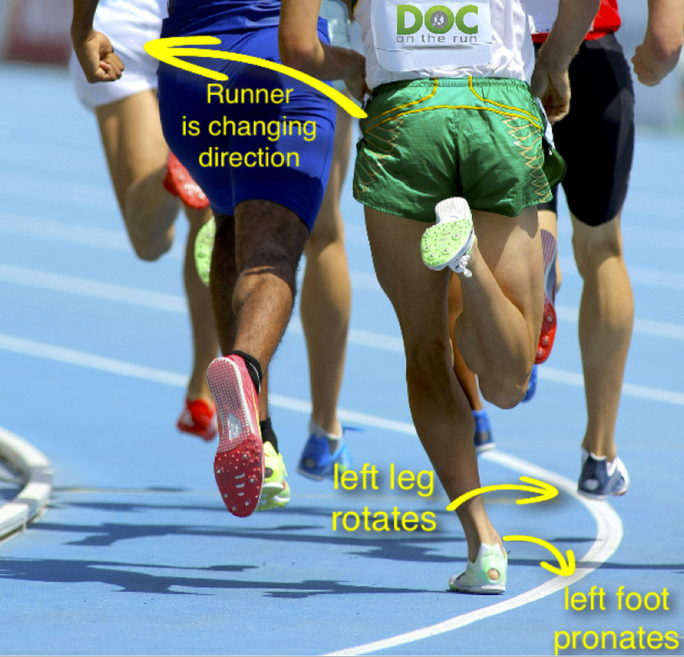 Direction (rotational pronation) Rotation is the last of the three forces related to pronation is abduction. Abduction is an outward rotation of the foot relative to the leg. A duck abducts its feet when it waddles along. Most humans abduct only as they pronate. The abduction is also more pronounced when a rotational force is applied. The most common way this happens is when changing direction and pushing off. Think about running around a left hand turn, such as the curve on a running track. As you round the curve, you are leaning slightly to the inside of the curve (to the left). Your left foot is internally rotating underneath you as you overtake the leg and push off toward the right. The right leg externally rotates, but also pushes off toward the right, or outside of the curve. As you round the curve, the external rotation of the right leg beneath you causes the right foot to pronate. As the foot pronates, the right arch lowers, lengthening the distance between the heel bone and the base of the big toe. As the foot elongates, the plantar fascia becomes taut, stretching out to resist the load as the foot rolls inward under the force of pronation. In contrast, the internal rotation of the left causes the left foot to supinate. The left arch heightens, shortening the distance between the heel bone and the base of the big toe. Because the plantar fascia spans these structures, acting like a bowstring, the supination lets the left plantar fascia relax. One direction around a curve increases the stress on one plantar fascia, while one direction decreases the strain on the other plantar fascia. You can use this knowledge to run with a minimal amount of force on the injured plantar fascia. If your left foot is the one suffering from plantar fasciitis, you are in luck! All you have to do is run the conventional counter-clockwise pattern around your local jogging track. If you run in one of the outside lanes, you will spend a larger percentage of the distance on the curve, hence capitalizing on the rotational forces that can give your plantar fasciitis a break. If you’re a fan of math, you can calculate the distance of curved running in each lane. Use the formula, L = 2S + 2pi(R + (n-1)w) to calculate the distances around the track for the various lanes. If you are not a fan of math equations, all you need to know is that lane 1 (the inside lane) is typically 400 meters. Lane 8 (the outside lane) is about 450 meters. If you run in Lane 1, you spend 50% of your time on the curves and 50% on the straights. If you run in Lane 8, you will spend an extra 50 meters on the curves for each lap around the track. If you want to increase your running distance while simultaneously decreasing the stress on the plantar fascia, stay wide and run in lane 8. If your right foot is the one with plantar fasciitis, you have to run the track in reverse. Unless you are there alone, it is better to stay in one of the outside lanes. It is just plain rude to run the wrong direction in lane 1. But nobody will care if you are running clockwise on the outside lanes 7 or 8. Keep in mind that running on a track to decrease the stress on the plantar fascia is only helpful if you have plantar fasciitis on only one foot. If you are suffering from plantar fasciitis on both feet, it is simply not helpful to run the curves. The key to running with plantar fasciitis is to maximize every opportunity to lessen the stress and strain on your injured but healing plantar fascia. Stay on flat ground and avoid hills. Look for a track and run in the direction that will supinate your injured foot to lessen the irritation. The simplest way to assess whether or not your strategy is working is to assess your pain level and the frequency of painful episodes. The most accurate way to track your pain and correlate it road surface conditions is keep a pain journal. Let’s say that right now you run on a flat jogging path and sense a small but notable amount of pain in the left heel and arch with every single foot strike. If you then alter your route and run on the street at the edge of the road, facing traffic, you might only feel the heel pain occasionally. If you are really fortunate, you may notice that your heel and arch pain instantly vanishes. In either case, it is likely that you have found a routine that will supinate the left foot enough to relax the plantar fascia and permit you to run without further damage t o the plantar fascia. If you don’t get immediate feedback, don’t give up. You can still make a judgement call by keeping a pain journal. One simple way for runners to do this is by adding a column to their training log. Rate your pain on a scale of 1 to 10. Note how many times you felt the heel pain during the run. If you only noticed the pain a few times, note how many miles it took before you noticed it. If the number of painful moments decreases, you are on the right track. If you supinate your foot by running on a supinating surface, and it takes more miles before you start noticing pain, this another indication that you are on the right track. In addition to the immediate feedback of determining who much heel pain you have when you run, you should also assess how you feel after you run. If you are running and placing too much stress on the plantar fascia, you may not have pain during the run, but might have pain later on. Delayed onset pain in the heel and arch results from the accumulation of inflammation within the tissue. This process begins during the run and continues for hours. If the inflammation is significant enough, you may notice throbbing in the heel and arch in the evening while you are relaxing. Some runners will report no pain during the run, or later that day, but will note a substantial increase in the morning pain level. If you currently have pain that you would rate as a 5 out of 10 when you step out of bed in the morning, and then you run on a supinating surface, your first step out of bed may drop to a 2 or 3 out of 10. Monitoring your morning pain level is an important indicator of whether or not you are doing enough to decrease stress on the plantar fascia while running. If you run on a supinating surface and feel certain that your heel pain is getting worse, you might want to experiment and run in the opposite direction. It may simply be that you are actually pronating the wrong foot. If this happens, don’t feel bad. I have tutored some brilliant medical minds on running biomechanics, and I have seen some very smart people get them backwards. If you are confident in your assessment, keep running while you treat your plantar fasciitis. Continue to monitor your pain level, making note of how far you run on a given surface. Once you are fully healed you can likely go back to your old routine and favorite running routes. If you have an injury other than plantar fasciitis, all you have to do is take the information that you just learned and apply it to your specific injury so that you can decrease the stress and strain, choose the best surface, run longer and heal faster.